If you are going to live and settle in Thailand then consider the following if you are going to live in Isaan and might very well require a lawyer in Isaan. We at Siam Legal have always take pride in the fact that we are not only Thailand’s largest legal services network but also the most trusted name by expats and foreigners alike in Thailand. We pride ourselves on hiring some of the best expatriate lawyers and local staff for all our branches. If you ever require a lawyer in Isaan consider speaking to us so that we may assist you out of our office in Chiang Mai or Bangkok. We have over the years managed some high profile murder trials in Thailand with regards to expats who found themselves on the wrong side of the law. We have also had our lawyer for Northern Thailand interviewed on MSNBC with regards to a high profile criminal and commercial matter which made news in the US. 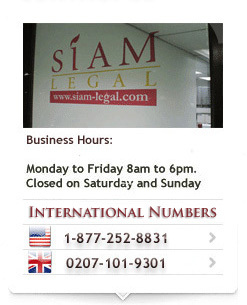 Speak to any of our lawyers in Isaan today for more assistance. With offices in all the main cities in Thailand and well-known for being very cost-effective, we can assure you of the best legal advice and assistance with the lowest cost. Call us today! Siam Legal (Hua Hin) Co, Ltd.